Treat your family with a delicious, yet healthy dessert! We offer 8 flavors with 4 twist varieties along with over 30 topping choices which include cookies, candies, fresh seasonal fruit and more! Frozen yogurt flavors and toppings availability vary depending on the season. Brewed Awakenings is a family owned and operated restaurant and cafe located in beautiful Williams, Arizona. We proudly serve locally roasted hot or cold Single Speed Coffee in addition to a delicious selection of sweet drinks and teas. Unlike any other place in town, our breakfast is filled with healthy options that keep you fueled throughout the day. We provide sit down or drive thru service by an eager staff that cares about your experience. Our experienced staff takes pride in the quality of our menu items. People of all ages can find something they’ll love at our store. Grab an espresso and a souvenir! Our coffee beans are roasted right down the road in Flagstaff and the food on our menu has standards. Avoid eating fast food when in Williams. Swing by our window for a healthy breakfast with your coffee! Like a lot of great discoveries this came by mistake an OH! NO! … This is great! 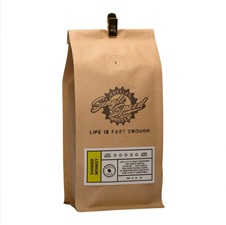 This coffee offers a blend of sweetness with chocolate, berry & nutty undertones. AHHH… This blend is full bodied rich and smooth. Chocolate undertones, the right amount of brightness, an excellent espresso. Very smooth, rich & clean. Full bodied & with low acidity. The main tone is going to be chocolaty. A deep semi-sweet chocolate smokey note balanced with a hint of a floral aspect. Full bodied, excellent balance of syrupy low tones with round fruit top notes, mellow finish, carries well through milk. Stopped by for a quick afternoon pick-me-up and was pleasantly surprised. I had a double shot of espresso with a little cream and it was smooth and flavorful. The tea selection was small but my wife was pleased with the vanilla one. Will stop here again. With parking right along the street, and a great vantage point to see the entire downtown strip, Brewed Awakenings quickly became our favorite first stop in all of Williams. The coffee is excellent, the WiFi is great, the booths are super comfortable, and with enough power outlets to get charged up. The best! Great vibe and friendly service. Cool seating area and decor. Coffee was fantastic. If you are on I-40 and driving by Williams AZ, stop by for a coffee break. On Route 66. The coffee tasted great. I ordered their namesake drink and was not disappointed. The drink had a nice balance of raspberry syrup, white chocolate, and espresso. Great cafe with excellent coffee, fast WiFi, and friendly service. They seem to be open late most nights which is a plus. Seems like a much-loved gathering spot for locals. Spotlessly clean. Sign up for our newsletter to receive exclusive deals, local insights, and keep up with us here at Brewed Awakenings! as well as for its beautiful scenery, outdoor activities, and other famous attractions. Submit your pictures and claim your spot on the map above for a chance to win discounts on future purchases or to be featured on our website and social media! To enter, click the button below and submit your information. Don’t forget to hashtag #BrewedAwakeningsAZ!